Wilfrid Laurier University has been awarded a silver rating in the 2015 Sustainable Campus Index for their work in sustainability and governance. The award, given to the university by Associations of Advancement of Sustainability and Higher Education (AASHE) and the Sustainability Tracking, Assessment & Rating System (STARS), assesses how post-secondary institutions are doing over time in sustainability. Claire Bennett, manager of Laurier’s Sustainability Office, says this is the highest rating the university’s Sustainability Office has received. “This is our highest rating so far. We started with a bronze rating [and] three years later we moved up to silver, but that was with a way more rigorous framework,” she said. According to Bennett, Laurier ranked in the 100th percentile for the corporation and planning category. They were also recognized as a “rising star” for their improvements from their previous STARS assessment in 2010. Since receiving the STARS award, Laurier has received international recognition from other universities who are participating in the assessment. “It’s really great recognition for us because it’s not just against Ontario partners, this is an international framework so it kind of helps put Laurier on the map,” said Bennett. Bennett noted that part of the recognition comes from having the Laurier Sustainability Action Plan — a document which provides guidance for supporting sustainability practices over the next five years on campus. Along with the silver rating, Laurier’s Sustainability Office has launched two initiatives to demonstrate their continuing dedication to sustainability efforts, the first being the Community Access Bikeshare. “There’s already stations around Waterloo Region, which makes it so useful so we have a station here on the Laurier campus and we’re the first university in the Waterloo Region to get one,” said Bennett. 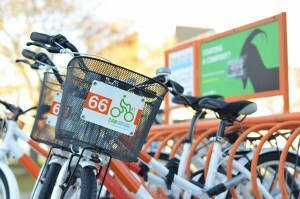 Presently, two bike stations are located in uptown Waterloo and several others in the Kitchener region. Students can access CABS memberships at these stations for $40 per year. Their new initiative with Laurier Entrepreneurship, the Sustainable Hawk Fund, is a way for students to implement their sustainable project ideas that will benefit the Laurier community. The Sustainability Office is providing $20,000 for funding.